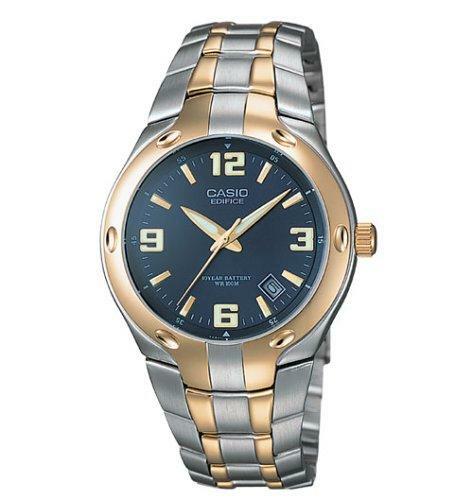 The Blue Edifice timepiece lends a luxurious edge to the traditionally sporty Casio line. Protected by a mineral crystal window, this men's watch features a round navy blue dial with gold-toned Arabic-numeral hour markers and hand indicators, and a date calendar between four and five o'clock. Made with a gold-plated stainless steel case, band, and bezel, the Blue Edifice is water resistant to 330 feet. Powered by quartz movement, it also comes equipped with a 10-year battery.